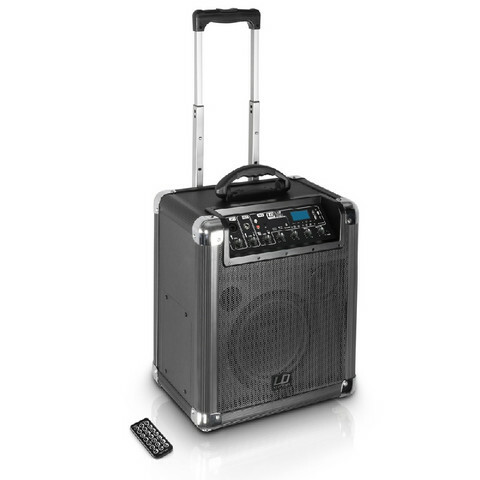 With built-in wheels and extension handles for cartingconvenience the LDRJ10 active 2-way system is your mobile sound station. It is powered by a rechargeable battery pack for up to 20 hours of continuous operation and provides a 90 Hz - 18 kHz frequency response with 100 watts of peak output. The LDRJ10's integrated mixer features 3 channels with individual volume controls, 2-band EQ, adjustable reverb and master volume. Combo, 6.3 mm TRS jack, RCA and 3.5 mm TRS mini-jack connectors acommodate a wide variety of input sources. A major feature permitting wireless streaming to the LDRJ10: the system sports a Bluetooth player which also supports SD card and USB storage devices. The player menu includes language selection and multiple genre specific EQ presets for instant sound adjustment. The Roadjack 10 also features corners for cabinet protection, a stand mount insert and includes a convenient IR remote control.